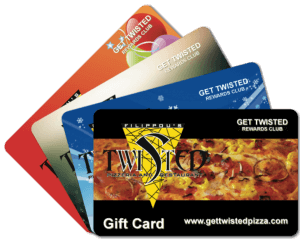 Twisted Pizza gift cards can be used when visiting one of our locations. You can even use Twisted Pizza gift cards when placing a delivery or pickup order online! Share your love with a Twisted Pizza gift card or just make a gift to your self.